I Love Sleep. Sleepy, sleep, sleep. I should preface this post with the fact that I have never actually seen Anchorman a disclaimer to appease the Mommy Wars combatants out there. I’m not using this post to brag, criticize, or diagnose. I’m not saying anything I’m doing here is better than anything anyone else is doing. I’m not claiming to be an expert at infant sleep or anything like that, but since we have a 4-month old who has slept pretty much through the night for a long time, I figure we must be doing something right. I’m just putting forth a list of things that work for us in the event that someone out there is frantically googling for help. Maybe something here will help. Maybe not. Whatever. Take what you need, leave what you don’t. If you don’t agree, feel free to keep on moving. Despite the awful first few months we went through with the Bean, I have to admit that she has always been a relatively decent sleeper. It was more difficult at first, obviously, but since she was about 8 weeks old we settled into a pattern and since then (knock on wood) she has been a rock star sleeper. I think what has made it work for us is 2 major things: routine, and her disposition. Not all babies like to sleep, plain as that. The Bean does! She is like her mommy like that. If I peek into her room during her nap before she is done sleeping, she will actually give me a look, turn her head away from me, and continue snoozing. Fine by me. So here’s some things that work for us in the sleep department. Like I said, I’m not looking to be contested or criticized, nor do I want people to think I’m bragging or saying that what I’m doing is better than anyone else. What works for one family doesn’t for another. 1. White noise machine. We have a little sound machine that I got at Walmart for like 15 bucks and it is awesome. It runs on batteries or A/C and has 6 different sounds. You can time it out to turn off after a certain amount of time, but I pretty much leave it on all the time. 2. Humidifier. Not sure if this contributes at all to the sleep, but I figured I’d mention it since we use it every night. It is SO dry up here, and I notice that if we don’t use it, she ends up boogery and congested the next morning. (So do we!) We have one that projects stars onto the ceiling which is an awesome night light, and it has a slot for Vick’s menthol…thingies? in the back so that if she is ever sick or congested, I can just pop one of those things in there and it will fill the room with Vick’s vapor. I think this cost me $30 or so but it has been a great investment. 3. Wrapping her. At first, she had to be swaddled to sleep. She is definitely one of those babies who prefers to be tucked in tightly. I am the same way though–I love climbing into bed and cocooning myself! Now that she is a bit bigger, I wrap her in an afghan tight enough that she feels secure, but loose enough that she can get her arms free if she needs. I have tried putting her in a sleep sack/wearable blanket, but the startle reflex is still in effect and she tends to wake herself up too much with those, so once that fades, I’ll start putting her back in that. 4. Naps! I am a true believer in that whole “sleep begets sleep” theory. Caroline naps usually 3 times a day, but sometimes she makes it 2 long ones. The trick, I think, is knowing her signs and schedule. 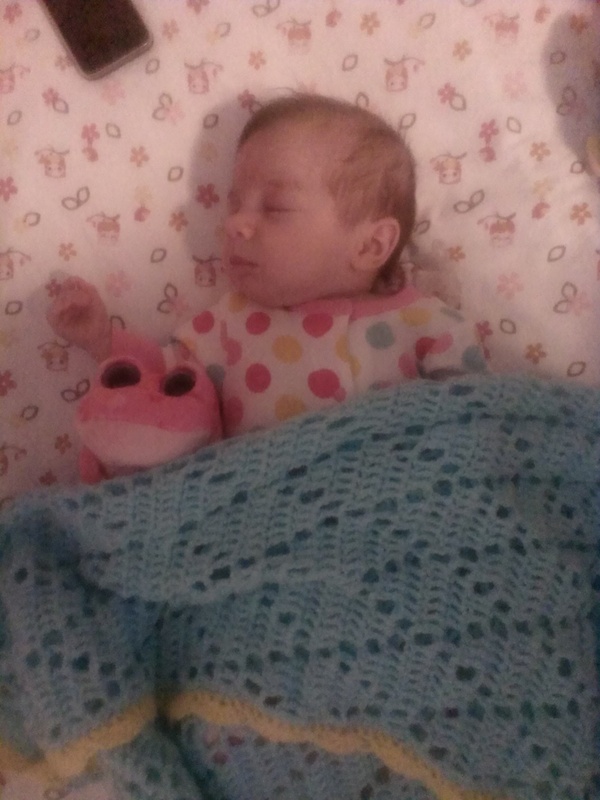 Right now, she can only go about 2 hours in between naps, so usually at the first sign of tiredness, I put her down. I don’t wait until she is really tired. I also have dark curtains in her room so that her room is sufficiently dark during the day. 5. Binkie/Pacifier/Soother/Whatever you call it. Binkies tend to be one of those divisive yes or no items in the battles of the Mommy Wars, but we use them. She isn’t addicted to her binkie, in fact she usually only wants/needs it in two places: in bed, and in the car. When I put her down for sleep, I pop a binkie in, and she goes right to sleep. Sometimes she wakes up in the middle of the night wanting it back, but that is actually getting less and less often now. I think if I just started not giving it to her, she’d be fine, but I figure for now it’s working, and if it ain’t broke don’t fix it. 6. Routine. This one is big, I think. Babies like routines. Late in the afternoon, she will usually go down for one last short nap around 5:00 or so, and even if she is still sleeping at say, 7, I will get her up and start our bedtime routine. I have a feeling if I left her to sleep, she’d be fine, but she’d probably be awake for the day way earlier than I’d like. Our bedtime routine generally consists of a warm bath, low lights in the bedroom, getting into her jammies, lavender lotion, sometimes a story, and finally I turn out the lights and sit in her rocker in the dark and give her her last bottle. Once she is done with that (or sufficiently sleepy and not eating any more) I burp her, wrap her in her blanket, give her a kiss and put her in bed. Pop a binkie in, turn on her sound machine, and walk away and close the door. I check on her once before we go to bed, but other than that, I don’t bother her. 7. Limited interaction during the middle of the night. Right now, she is usually waking once a night to eat. When I hear her fussing on the monitor, I get up, make her bottle (I bring the formula and a clean bottle into the master bathroom before we go to bed since our kitchen is downstairs and it’s just that much faster), pick her up out of bed, change her (if I don’t she is usually soaked through her jammies by morning and I’d rather let her continue to sleep comfortably for as long as possible), and give her her bottle. Then burp, a kiss, back in her blankie, and back to bed with her binkie. I don’t turn on the lights, don’t talk to her very much, and keep things very quiet and calm. 8. Bedtime/Naptime in the crib. For the most part, Caroline has only ever slept in one place: in her crib. Obviously at first she napped frequently in her chair or in her wrap, and she sleeps in the pack and play when we visit her grandparents, but 99% of her nights have been spent in her crib. I’m not comfortable with co-sleeping and have only ever done it a few times when we were really desperate for sleep. Caroline knows that her crib is her safe place and that is where she goes to sleep. Even on night #1 home from the hospital, she slept in her crib in her room. Now–I should point out that we are lucky enough to have an extra bed in her room, and we slept in her room with her for about 8 weeks. I understand this isn’t a possibility for most people and you want to be close to the baby those first few weeks, which is 100% understandable. 9. She sleeps on her tummy. I know, I know. Big supposed no-no. But raise your hand if you were brought up in that generation when tummy sleep was not only the norm but it was recommended. The recommendations regarding SIDS change so often because nobody really knows exactly what causes it. I didn’t sleep her on her belly when she was a newborn, obviously. I waited till she was big enough and strong enough to lift her head, turn it, and support herself on her elbows. She just doesn’t like to sleep on her back. I started it out with naps, so that I could check on her frequently. Finally, I just started doing it for night time too, and she sleeps great. I think you have to feel 100% comfortable with this, though. 10. We let her cry. Yep, another battle cry for the Mommy Wars. If you haven’t already guessed, I’m not big into the whole gentle/attachment parenting thing. Just not my style. If I’ve just put her back to bed after her midnight bottle and I know that she is dry, full, and has burped, but she’s crying or fussing, I’m going to give her a little time to work it out on her own because I know she’s going to go back to sleep. (If anything, I will pop her binkie back in.) I never, ever rush into her room upon the first peep that she makes. When she is napping during the day, if she’s only been down for 45 minutes and I know she could go longer, I will give her a few minutes and if she doesn’t go back down, I’ll sneak into her room and put her binkie back into her mouth and usually that will do the trick. Obviously there are limits to this, I’m not going to let her scream for 45 minutes, and I wouldn’t do this with a newborn, but you get the idea. I know she knows how to put herself back to sleep and I think that’s super important with establishing good sleep habits. So there you have it. Those are the sleep tricks that work for us–for the time being, naturally! I know things often change once teething begins, but I also think that establishing good sleep routines from the beginning helps a lot. I kept seeing people online talk about a 4-month sleep regression, but I don’t think we’ve had to deal with that. Every night is pretty much golden! (Not to press my luck or anything.) I’m happy to elaborate on anything you’re interested in hearing more about.